Dyshidrotic Eczema is also known as Dyshidrotic Dermatitis and Pompholyx Eczema. Although it has been given this name, sweating is not reported to be a cause of this type of eczema. It has been reported that up to 40% of sufferers have excessive sweating as one of their main symptoms. Although this link is yet to be proven. Pompholyx means 'hand and bubble'. This name is a good description of how it looks and where on the body it is found. It mainly affects people between the ages of 20 and 40. It occasionally appears in teenagers and the elderly but not its not as common. Women are twice as likely to be affected than men. It mainly affects the palms and the sides of the fingers. Also appearing on the feet. One of the symptoms is small, fluid filled blisters. They look like little bubbles, and have been described as looking like tapioca. The blisters start off small. They can look embedded in the skin. Overtime they may merge together to form big blisters. Sometimes they clear themselves after a few weeks. The skin can be itchy. It is strongly advised not to scratch the affected area. This can break the blisters. The fluid inside is then discharged. The fluid will dry. This forms crusts on top of the affected skin. In time these crusts will crack. This increases the likelihood of an infection occurring. When the condition is around the nails they may have a cratered or ridged look about them. The definite cause of why someone is affected by Dyshidrotic Eczema is unknown. When someone has a outbreak there are things that may worsen the condition. These are similar to the triggers in other types of eczema. It can be basically anything that comes into contact with the affected areas that causes a problem for you. 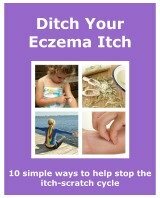 Dyshidrotic Eczema can be fairly easy to treat. Unfortunately it can reoccur fairly often. Treating it right is important, but so is taking care of the skin to prevent another outbreak. If a staph infection occurs a course of antibiotics will be prescribed. Though it is best to try and prevent an infection occuring. Look after the skin, and no scratching! Skin care is very important after any treatment has improved an outbreak. It helps to reduce the chance of a recurrence. Keeping the skin moisturised with emollients is the most important way. Also taking precautions to prevent aggravating the condition is vital, especially to the hands. If an outbreak reoccurs use any treatment needed and continue with any preventative measures to look after your skin. The look of this type of eczema makes it relatively easy for a doctor to diagnose. Your doctor will look for the blisters on the hands. They will also ask if your skin is itchy and if it is worse after contact with anything or when you sweat. By getting it diagnosed properly will ensure you get the right treatment. You can then take all the measures you can to look after your skin. 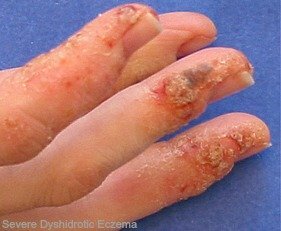 This type of eczema can also appear alongside Atopic Eczema. It is thought that around 50% of people with Dyshidrotic Eczema also have Atopic Eczema. The severity of it can be mild to severe. Sometimes the condition clears up in 3-4 weeks. Sometimes it can come and go. By continuing with moisturising, treatment and management, you will limit the amount of outbreaks you have.